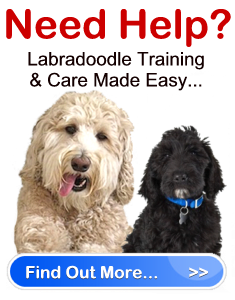 Proper Labradoodle care is how you keep your dog healthy and happy. Care doesn’t only mean grooming your dog and taking him in for regular vet checkups, it also is about being aware of the any health problems that may or are currently affecting your dog. All dogs are prone to a genetic health problem, some more than others. Although the Labradoodle is an overall healthy hybrid breed, they did not fully escape the genetics of their parents and are prone to hip dysplasia. Hip dysplasia runs deep in the heritage of both Standard Poodles and Labrador Retrievers, so it should come as no surprise that this issue could be a problem for Labradoodles. Nevertheless, although you may not be able to prevent hip dysplasia from developing in your dog, there are ways that you may be able to lower your dog’s risk by learning about the condition and following important Labradoodle care tips. What is hip dysplasia? It is a genetic condition that generally affects large dog breeds. It is characterized by a malformed hip joint that does not properly fit into the socket as it should. This condition becomes increasingly worse as time passes, and the constant wearing down of the joint can be quite painful, often resulting in other health problems such as arthritis. If any of these symptoms are present, it is important you make an appointment with your Vet as soon as possible to provide the necessary Labradoodle care and diagnosis for your dog. How is hip dysplasia diagnosed and treated? Hip dysplasia is diagnosed after a standard X-ray is taken. Treatment is determined based on the severity of the condition. In extreme cases, a vet will recommend surgery. However, in most cases, alternative remedies such as exercise and other adjustments are recommended to help the dog cope. Strengthen the joints – One of the best ways to help support your dog’s hips is to strengthen his/her muscles. Strengthening the muscles helps to relieve some of the pressure and tenderness off the hip joint. Make sure you take your dog on two, 20 minute walks daily. You can go on more walks or extend your regular walk, but only if your dog is up to it. Never push your pet to exercise if he/she is exhibiting pain. Another good exercise to help strengthen the muscles is swimming. Swimming not only gives your dog’s body an excellent workout, it also allows him/her to exercise without placing any extra stress or strain on their joints. Make sure your Labradoodle is warm – If your dog is experiencing pain in his/her hip joint, cold, damp weather can make the pain worse. Keep your dog indoors in cold, rainy weather, and make sure he/she has a nice, warm comfortable place to rest. Specialty bed – There is more than one type of bed available for Labradoodle care. If your dog suffers from hip dysplasia, you may want to invest in an orthopedic bed. This specialty bed can distribute your dog’s weight evenly which will take excess pressure off sore joints. Make stair climbing easier – make a ramp for your dog to use to allow him easier access to all the high places he/she’s permitted. You can make a ramp going up the stairs by using an old board, as well as portable ramps for beds and couches. A ramp will stop your dog from making a hoping motion that is required in order to climb steps and jump off/on couches. Over-the-counter (OTC) Meds – If you know your dog suffers from hip dysplasia and sometimes experiences severe pain, Vets often recommended that dog’s be given aspirin. Speak to your Vet about the recommended dosage so you don’t run the risk of injuring your dog. OFA – Last, but not least, as part of Labradoodle care, you should ensure that the breeder you are purchasing your dog from has had the parent’s hips certified with the Orthopedic Foundation for Animals (OFA). To learn more about hip dysplasia, consult your Vet.